Certain countries have reputations for drinking booze. Much of this is ingrained in cultural tradition and industry: Think of the Irish tendency to relish a glass of whiskey, or Russia’s inextricable link to swilling vodka on cold winter evenings. But how much do people across the world drink, and do cultural reputations really hold fast when hard data is analyzed? From data journalist Matt Stiles comes an intriguing map that synthesizes per-capita rates of alcohol consumption in 186 countries across the world. Stiles pulled data from the World Health Organization’s recorded alcohol per capita consumption table, which tracks the heaviest drinking countries from 2000 to May, 2016. It’s an interesting project, and one that finds eastern Europe carrying the mantle for harder drinkers worldwide. To start, Belarus is the most tethered to booze, finishing a solid first place in the rankings “with a per-capita rate of about 17.3 liters of alcohol consumed annually,” Stiles notes. Not far off is the bordering country of Lithuania, which consumes a healthy 12.66 liters per person a year. 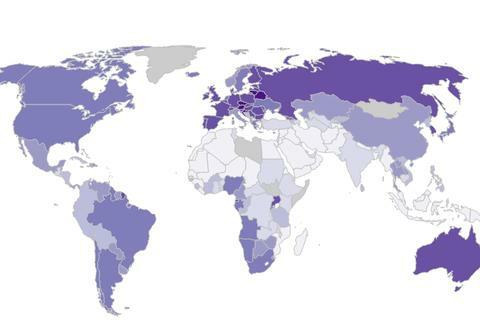 Note that the darker the shade of purple signifies a higher proportion of alcohol consumption, and you can peruse an interactive version of the map here. You’ll note that Europe is the booziest, probably owing to a more relaxed culture in the continent's western countries -- consider Spanish siestas and French people’s undying love of wine, for example -- and that in the theocracies of the Middle East, booze isn’t even really available to your average consumer. The United States comes in a humble 41st place of 186 countries, even though we have all sorts of hifalutin contraptions and self-driving trucks making it easier to drink beer. What’s kind of jarring is smaller countries that maintain a formidable rate of drinking. Ireland, for example, drinks more than Russia, with a rates of 11.72 outweighing the massive country’s 11.04 liters consumed on a yearly basis. England is up there, too. As a nation full of publicans, the Union Jack flies high, ranking a solid no. 17 on the list. The data was calculated using “using each country’s production, import, export and sales of alcohol and its mid-year population (age 15 and older) in 2011,” which is probably a better metric than measuring burp frequency or money spent on cocktails.